An award with 0 detail plates will need templates ordered for the sides or an extended base if you plan to add detail plates later to make it a perpetual award. More information. Affordable Trophies provided this award for TIKI BARBER! 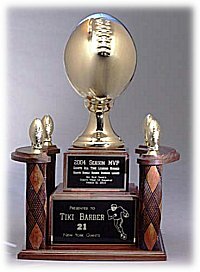 Representatives of the New York Giants purchased a customized version of this award to present to Tiki in recognition of his being named the team's most valuable player for the 2004 season, and for setting franchise records for most yardage gained both in a season and in a career. Affordable Trophies provided this same award for MICHAEL STRAHAN after the 2005 season. 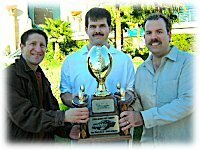 This award was also presented to the winners of the 2004 and 2005 Fantasy VIPs Contests. Our "Master" series is our largest line of trophies. 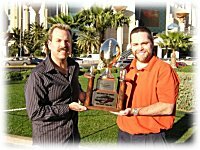 The "Football Master" Trophy is only for the leagues that absolutely have to have the best. The base is genuine walnut. Title plates on the front are black brass, matted on a gold plate. This huge award weighs in at about 12 pounds. 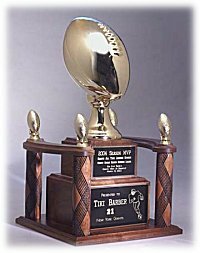 This can be customized with up to 42 detail plates to make this a traveling trophy. This item ships fully assembled and double-boxed. We have several title plate layouts to choose from!